Studio Voltaire’s retrospective of the Neo Naturists is the first time a public institution has exhibited the 1980s performance group and their work. It offers an insight into the outrageous, comical, and strangely beautiful movement led by sisters Christine and Jennifer Binnie, and Wilma Johnson. As well as works provided by the original trio, the show also exhibits pieces by contributors to the movement, the then unknown potter Grayson Perry and film maker John Maybury. It is something of an archive of The Neo Naturists and Studio Voltaire’s interior has been filled with newspaper cuttings, props, and pieces from their performances alongside ceramics, paintings and videos. The walls of the space are covered with imprints of womens’ naked bodies and there is something very tribal about the overwhelming aesthetic of the darkened room and the work within it. The gallery’s Methodist Church origins provides the interior with the feeling of being inside a chapel and the show possesses a pagan quality. But it isn’t clear what one is supposed to be worshiping, the modern or the natural? The movement seems to incorporate both; there is an acknowledgement and enjoyment in nature as well as modern, urban culture. The distinctly primal, sensual aspect to the work shown seems to be an appreciation of the natural world. Jennifer Binnie’s Women and Man hang on scrolls of canvas on one side of the huge room. 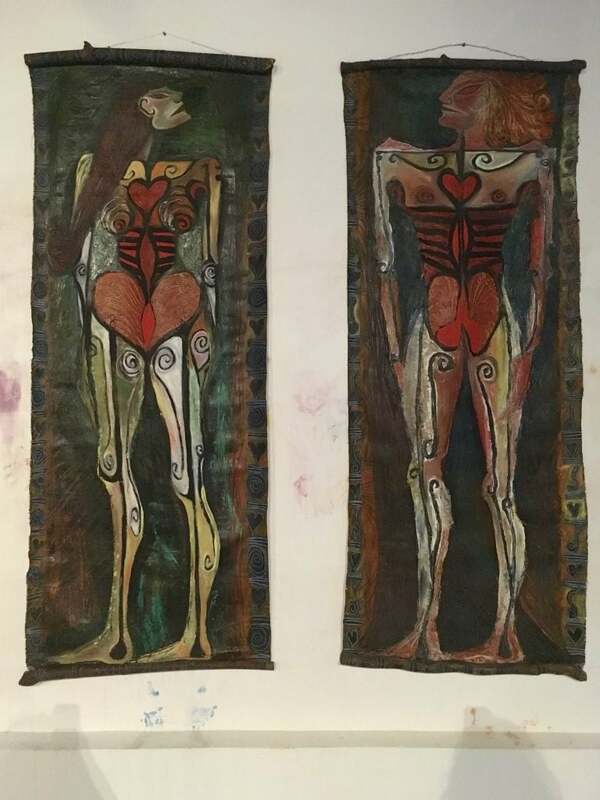 The thick layers of paint and patterns depicting a flayed, but strangely unaggressive, naked man and woman possess a ritualistic quality. With their profiles facing one way and feet facing another, their twisted stance is reminiscent of a hieroglyphic or cave painting. Wilma Johnson’s paintings of multicolored female forms dancing around a maypole as well as the sounds of nursery rhymes in the video pieces add to this sense of the natural and traditional; they provide an homage to time gone by. But at the same time the Neo Naturist show and the movement itself could not be accused of earnestly idolizing a rural past as it also celebrates the 1980s post-punk club scene in which the Neo Naturists had a key role. The huge wall high projected videos of their public performances show scenes in clubs with strobe lights and psychedelic music. 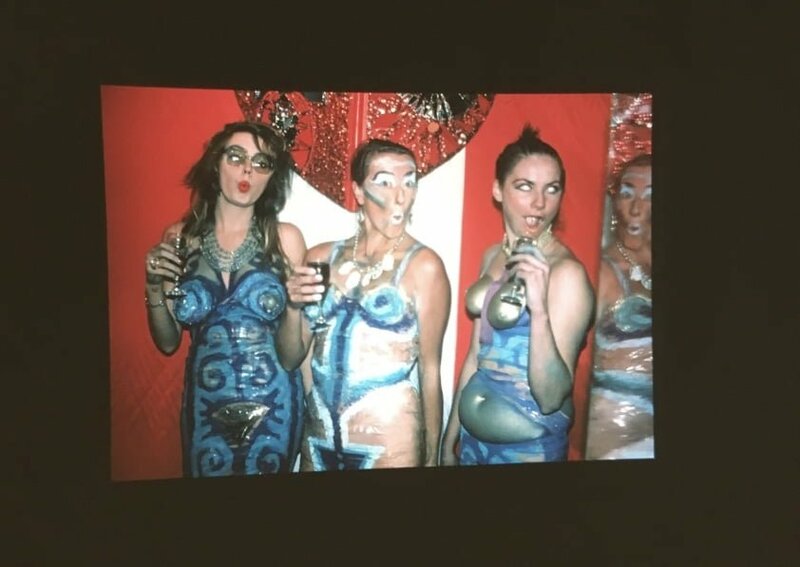 Wilma Johnson and Christine and Jennifer Binnie are shown performing covered in metallic body paint and often using gaffer tape to stick objects to themselves and to distort their bodies. This gives the video pieces a more modern, urban edge. The thumping music and flashing lights create a bizarre environment for these gyrating priestesses with their swirling scarves and long hair. With this aesthetic the show combines both ancient tradition and outrageous nightlife posturing with a creative freedom as well as the craft skill seen in the ceramics and paintings on display. However, while the show straddles both nature and modern popular culture it does so with a knowing sense of humor. There is a strong feeling that the performance group and their work was greatly to do with fun and while there is clear commitment to their art, the Neo Naturists are also not a group that take themselves – or the world around them – too seriously. When I left this inspiring exhibition, though I kept my dress on and was sadly free of body paint, I nonetheless felt strangely liberated. It served to reveal to me just how inhibited we still are and that we need more Neo Naturism in our lives!